This blog post originally appeared at New America as part of the Early Learning and ESSA Blog Series. Relationships and interactions between teachers and students make a big difference in the classroom. 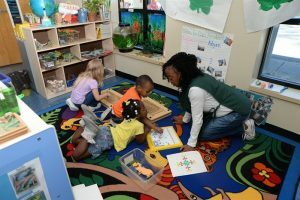 Teacher-child interactions form the cornerstone of children’s academic and social emotional development, especially in early learning classrooms. As states look for ways to measure and improve educational quality beyond test scores, the federal Every Student Succeeds Act provides an opportunity to consider data on teacher-child interactions. 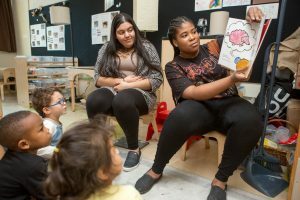 Washington, DC, and Louisiana provide two examples of states exploring this promising avenue, with some valuable lessons for their peers who might be considering teacher-child interaction measures, or other non-traditional quality measures that include or emphasize the early years. So, what should other states take away from DC and Louisiana? This entry was posted in Accountability, Early Childhood Education, Education Policy, Federal Education Policy, State Education Policy, Uncategorized and tagged Accountability, birth to eight, Class, early childhood, early childhood education, ESSA, Every Student Succeeds Act, pre-k, prek3rd on June 6, 2017 by Bonnie O'Keefe. Do You Have Opposability and Cross-class Expertise? More to come on what this means for the education sector, but for now I want to dig into two skills that Brooks mentions that are particularly valuable for education leaders. The first is opposability – the ability to hold two opposing ideas in one’s mind while still retaining the ability to function (a la F. Scott Fitzgerald). The education sector is wrought with polemic arguments that present policy solutions as mutually exclusive, but behind those arguments is intimidating complexity and startling nuance that exposes the vast gray area where most issues reside. For instance, high-quality, competency-based instruction is not incompatible with annual tests and accountability measures, yet I don’t often see education leaders and policymakers employing the mental opposability that could reconcile these ideas into powerful policy and practice. The second is cross-class expertise – the ability to operate in an insular social niche while seeing it from the vantage point of an outsider. In a conversation with my colleague Saamra Mekuria-Grillo, at the Pahara Institute, we broke down cross-class expertise into two kinds: native and learned. Native cross-class expertise is a skill acquired by mixed-race, bi-cultural, or mixed-class people or those who operate in highly diverse environments for extended lengths of time – much like how being immersed in a digital culture results in digital natives. Learned cross-class expertise pertains to people who operate in a racially or culturally homogeneous environment but proactively gain exposure to new cultures, perspectives, and experiences to inform their work and personal development. Should the education sector learn to value opposability we’d move closer to public debate that’s more civil, productive, and nuanced. And more cross-class experts could help reconcile the urgency to close achievement gaps with reforms that include the communities where they exist. This entry was posted in School Leadership, Talent, Uncategorized and tagged Class, Cross-class expertise, Leadership, Opposability, Pahara Institute, Race, Skills on March 18, 2015 by Jason Weeby. When I’m in a professional setting and I see a conversation about race materializing, my heart beats faster and I become acutely tuned into the room’s social dynamics. My whiteness is top of mind. I interrogate my observations and comments before sharing them. I load my statements and questions with qualifiers the way you might pack a fragile vase to be shipped cross-country by freight. And I shipped truckloads of freight on Tuesday night. Education Pioneers (EP) hosted an alumni event called Black Lives Matter to the Education Community, where I joined about 20 education leaders representing EP’s diverse network to reflect independently and engage in small- and large-group “courageous conversations about race” prompted by the tragic deaths of Michael Brown and Eric Garner. It’s my understanding that the event was first-come-first-served, so the demographics were largely a function of chance. Even so, the room was fairly racially diverse, although there were fewer black attendees than I would have expected considering the topic. The Education Pioneers’ program team is full of expert facilitators so it wasn’t surprising to see a thoughtful agenda that began with introductions and brief check-ins on everyone’s feelings and expectations for the evening. “Eager,” “vulnerable,” “nervous,” and “open” were common sentiments. But even with the best facilitation and when everyone’s part of a trusted and familiar professional network, there’s always a fair bit of hesitation to dive into a discussion about race with semi-strangers. Raising issues about race in a professional setting can be fraught with risks including personal discomfort, poorly received messages, and marginalization. As a result, public dialogue tends to be academic in nature and disassociated from lived experiences and feelings. In general, this was the tenor of the conversation on Tuesday too, but there were moments when people left their comfort zone to share their perspectives. In those moments, the room seemed quieter and participants were more reverent, sensing that something uncommon was happening. This entry was posted in Talent and tagged Class, Education Pioneers, equity in education, Leadership, Race, Racism, Talent on February 20, 2015 by Jason Weeby.